Easter is right around the corner, and boy don’t we know it. I mean, since the morning after Valentine’s Day there’s been no escaping the constant onslaught of pastels and fuzzy baby animals. And hey, far be it from me to hate on a holiday — I’ll take just about any excuse to celebrate. My real problem is with stores that see holidays as an opportunity to overcharge for things that would usually be a fraction of the price. And one of the worst offenses? Easter candy. I’m supposed to pay extra just because the candy comes in a pink, bunny-covered bag?! Yeah, OK. But what’s a serial over-celebrator (and budding Penny Hoarder) to do when she doesn’t want to pay extra for the candy that wasn’t even that great to begin with? She makes treats at home, of course! Instead of spending extra money on store-bought, pastel sugar bombs, I found five adorable (and seriously simple) Easter treats you can make for just a few dollars each. And if you want to forego the store-bought sweets altogether, make these recipes ahead of time, wrap a few individually with a fancy ribbon, and put them in your kid’s Easter basket! This take on the classic Rice Krispies Treat comes with a colorful surprise, and it’s so simple to make! Then, melt one 12-ounce package of white chocolate morsels in the microwave in 30-second intervals until smooth. If the chocolate is too thick to coat a spoon easily, stir in a tablespoon of coconut oil or shortening. Dip the treats in the chocolate (you may have to pop it back in the microwave once or twice to keep it smooth), and finish them with colorful sprinkles while the coating sets. These bring back some seriously sweet childhood memories — I don’t remember a single Easter going by without enjoying one (or two or five) of these tasty little cookies. And they only take about 10 minutes to make! Microwave the chocolate chips in 30-second intervals until smooth, being careful not to overheat. Add the peanut butter, and stir until melted together. Dump the bag of chow mein noodles into the melted chocolate and mix until fully coated. Drop the mixture by the spoonful onto a waxed-paper-lined cookie sheet to create the “nests.” Then, press a dent in the middle of the “nest” with the back of a spoon (or just use your fingers — it’s your kitchen). This one actually makes a fun activity for kids. Supervise the melting and pouring of the chocolate, but let them go to town with the decorations! Line a baking sheet with waxed paper. Melt the chocolate in 30-second intervals in the microwave, stirring frequently. Pour the melted chocolate onto the lined baking sheet and spread evenly. Top with colorful sprinkles, and allow to harden before breaking into bite-size chunks. You can put these on a stick to make them “Peep pops,” or leave them as they are — they look like tiny versions of the classic chocolate bunny! Melt the chocolate in the microwave (you’ve got this down by now, right? 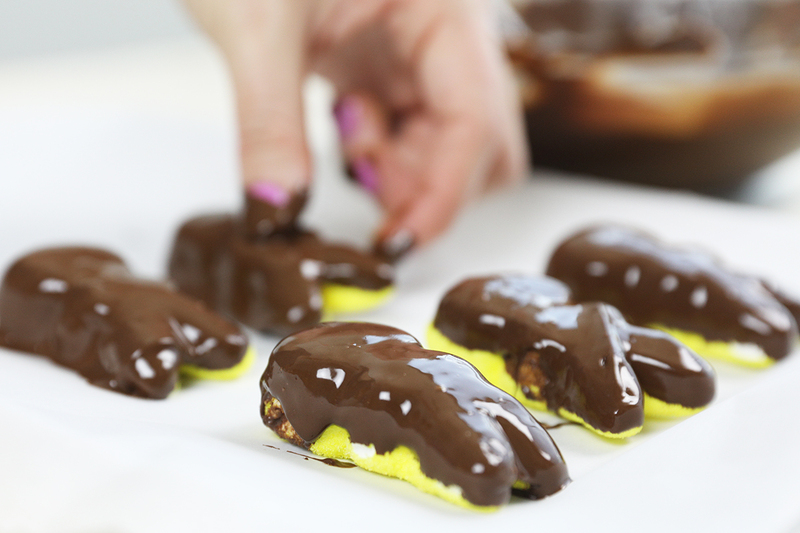 ), dip the Peeps until fully coated in chocolate, and press three little sprinkles into the chocolate as it hardens to create a face. Wait, that’s the whole thing? Well, easy enough. If you’d rather not pump your kids full of sugary sweetness right before Easter lunch with grandma, here’s a slightly healthier, but still adorable, easter snack idea! And there you have it: Five of the easiest, quickest Easter treats that will make you look like a professional Pinterester — and are kind to your budget, too! Your Turn: What’s your favorite Easter treat?